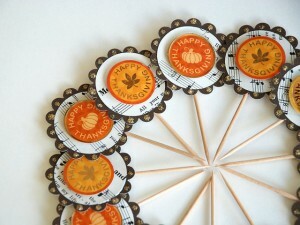 No, this blog post is not about trendy non-turkey Thanksgiving dinners. Many of us may automatically associate turkey with American Thanksgiving. But there are many other countries around the world that celebrate the season of harvest with their own traditions and without that particular bird. Although celebrations differ in many ways, one of the key concepts of all of the holidays introduced below is giving thanks. 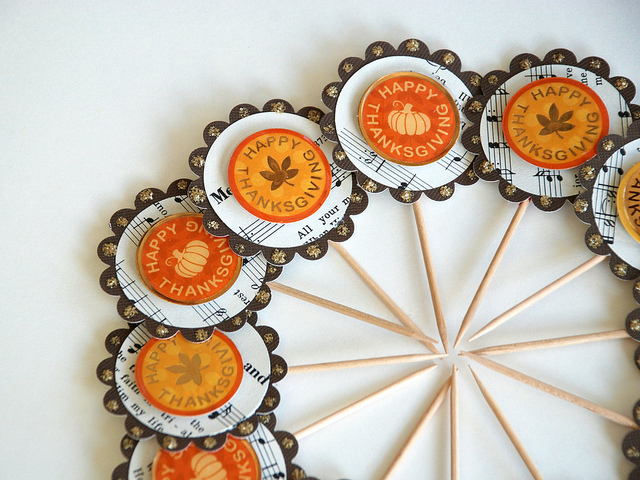 Ch’usŏk or Hangawi is a three-day celebration of harvest and thanksgiving. It is celebrated on the 15th day of the eighth month of the lunar calendar. During this time, the moon is at its fullest and brightest. Because this holiday follows the lunar calendar, the celebration’s date changes every year on the solar, or Gregorian, calendar. Therefore, Ch’usŏk was most recently celebrated on September 26th, 2015. People travel across Korea to reunite with their families, pay respect to their ancestors, and to enjoy each others’ company with good food and games. 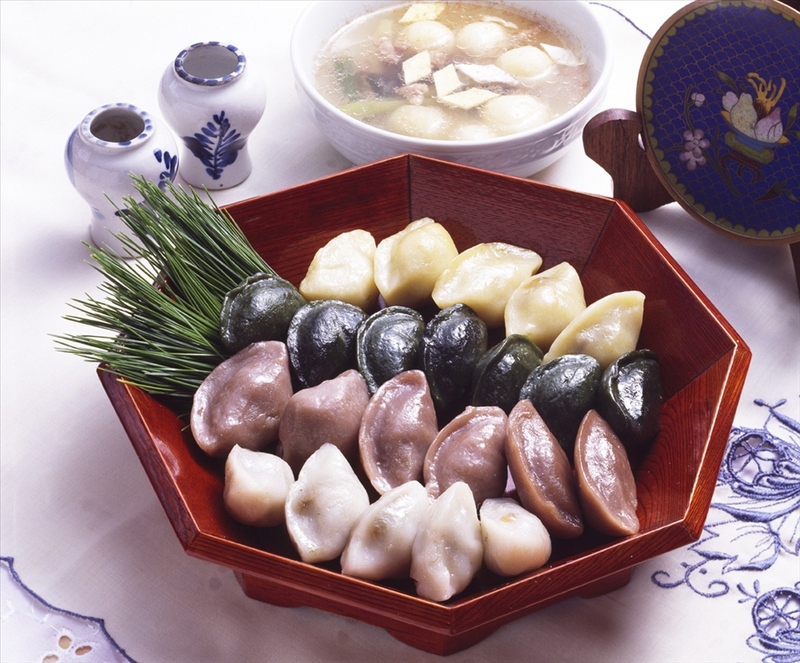 One of the traditional foods associated with this holiday is songpyeon (see below). Families gather to make this rice cake filled with different fillings such as sweet sesame seed, mung bean, and red bean paste. It is said that whoever makes the best-looking songpyeon will have the prettiest daughter. Want to give Korean holiday cuisine a try? Check out Traditional Food: A Taste of Korean Life from our library! Picture of songpyeon, crescent-moon rice cakes. Songpyeon is a special Ch’usŏk delicacy filled with a paste made of chestnuts, jujube, sesame seeds, and red beans. Historically, this holiday was celebrated with the playing of a traditional wrestling sport called sirrum, as well as with a version of tug-of-war, tightrope performances, and a dance known as ganggangsullae, or “hand-in-hand under the moon.” Although these activities have not disappeared, it is now more common to watch them on television than to do them in person. Check out Annual Customs of Korea: Notes on the Rites and Ceremonies of the Year from our library to find out about other Korean holidays and rituals! Pongal is a harvest festival celebrated in Tamil Nadu, a state in southern India. The holiday has been celebrated for more than a thousand years and is considered one of the most significant Hindu festivals. The four-day celebration gives thanks to nature for a fruitful year of grain, turmeric, and sugar cane. It falls in mid-January and each day includes activities filled with traditions and rituals. The first day is called Bhogi and on this day people throw away and burn old belongings and clothes. The act of burning signals the start of a new life cycle. People prepare for the celebration by cleaning and decorating their houses with painted kolams, or designs drawn on the floor using multi-colored rice. 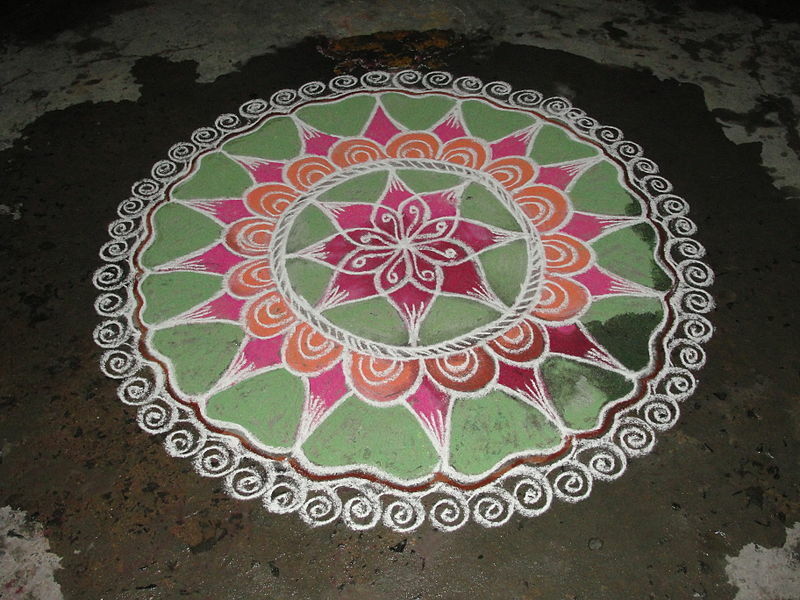 Painted kolam on the ground. The second day is called Pongal or Thai Pongal and is celebrated with rituals such as letting fresh milk boil over a vessel. 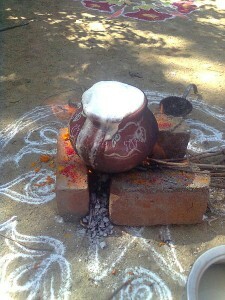 The name of the overall holiday festival, Pongal, means “boil over” or “overflow,” and is derived from this ritual. People continue the day by eating food and visiting each others’ homes. Fresh milk boiling over in a vessel. On the third day, or Mattu Pongal, colored beads, bells, flowers, and ears of corns are tied around the necks of cows and worshiped. As the cattle enter the village center, sounds from the bells signal villagers to race their animals against each other. The festivities continue on to the fourth day, also known as Knau Pongal. Women perform the ritual of leaving cleaned turmeric leaves on the ground. The leaves are topped with leftover milk from the boiling of the day before, rice – both colored and ordinary – sugar cane, and plantains before participants take part in ritual bathing. They then gather and wish for prosperity for their households. Interested in finding more about this holiday and other Hindu holidays? Check out Hindu Feasts, Fasts and Ceremonies from our library. 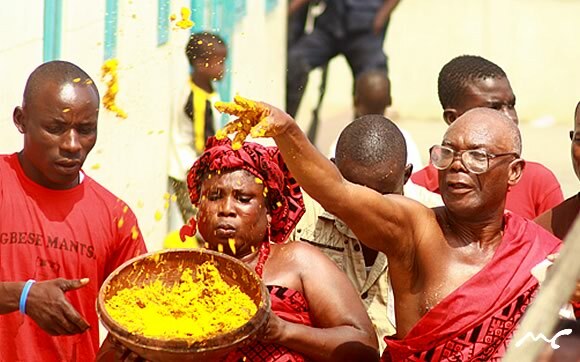 A Ga traditional leader sprinkling food to signify abundance. Homowo, sometimes called “Yam Festival”, is usually celebrated during the month of August. The word homowo can be translated as “to hoot at hunger,” which explains the origins of the festival. It originally began with the Ga people fighting against great famine through vigorous food cultivation, resulting in a great harvest. The festival remembers the period by celebrating the season’s harvest through cooking food using yams, one of the major crops of the country. The festival is signaled a month before with the banning of drumming and other noise-making in the Greater Accra area. The festival proper begins when a priest sprinkles a self-made concoction onto the royal family to fend off evil spirits and for good health. A special meal, kpokpoi, made from maize and palm-nut soup, is served. This food is then taken to the chief for blessing before the meal. The priest sprinkles the food on the ground to give thanks to the gods. The king presents participants with his annual speech and the chief priest prays for the people. Drumming and dancing resume and people enjoy the festival. Throughout the holiday, participants are encouraged to remember that with determination and willpower, anything is possible, just as their ancestors once proved by overcoming famine. More information about the festival can be found in The Ga Homowo, available through our library. You can also contact the subject/area specialists at the International and Area Studies Library to dig deeper into holiday customs and celebrations. The University’s cultural houses on Nevada Street hold regular cultural celebrations and events. All are welcome! For more posts like these and for other international information, follow our IAS Facebook page. This entry was posted in Culture, Global Events, Resources, U of I Library Resource and tagged chusuk, Ghana, holiday, Homowo, India, Korea, kpokpoi, Pongal, Tamil, thanksgiving by Audrey Chun. Bookmark the permalink.